OK, you guys. You win. 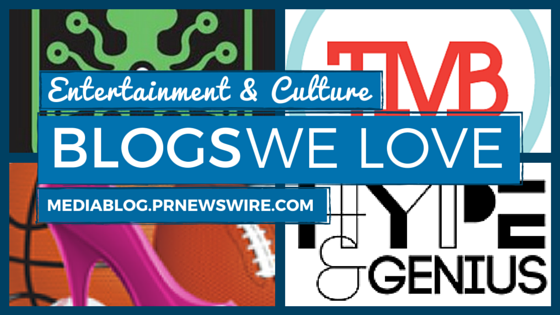 I get a great many entertainment and culture blog submissions over on PR Newswire for Bloggers. So let’s start the new year entertaining. Over the holiday, I saw Star Wars. This inspired me to check out The Movie Blog. The blog was created in 2003 by John Campea, who began blogging just a couple years prior about his experiences, thoughts, opinions and interesting links with people. More and more, his thoughts were about film. So The Movie Blog was born. I like this site for a lot of reasons, starting with the comprehensive way it covers movies. The site features news chats, reviews, trailers, posters, and interviews. Some posts that I found interesting include X-Men: Apocalypse Finally Has a Trailer, The Magic of Practical Effects, and A Very Murray Christmas. The blog serves as a guide for women who need “their sports information in a hurry.” The site is managed and written by Sandra Florent. Florent covers college sports, events, MLB, NBA, NFL, and NHL, to name a few. I have to admit, I’m not a sports-watcher. But I do appreciate blogs that write about things I don’t quite understand, because they force me to think outside the box. Hype&Genius is the music and culture site of blogger Korina. According to the blog, before Hype&Genius, there was Dream//Believe//Achieve. Korina single-handedly ran the blog, which today features several authors, contributors, photographers, and videographers. Hype&Genius is a cool site. Some notable posts include NBA & Adidas Unveil All-Star Uniforms, Mathieu Ajan’s TreeHouse Exhibition, and Exclusive Interview with Fatai. Laughing Squid is an art, culture, technology blog based in NYC. It was founded by publisher and editor-in-chief Scott Beale. There’s some great content on this site – and the range of information really is impressive. Honorable mention goes to A Pair of Creepy Life-Sized Victorian Dolls Spook, Surprise and Confuse the Commuters of London. P.S. Ever wonder how we come up with ideas for our blog profiles? Our handy list of industries and subjects on PR Newswire for Journalists stays top of mind. If you’re a blogger or journalist looking for entertainment, art, or sports news, let us know. We can customize a newsfeed for you on PR Newswire for Journalists. Thank you for sharing what I was looking for! These are some pretty interesting blogs you have mentioned here. I am not a big fan of sports blogs either, but will give it a try.